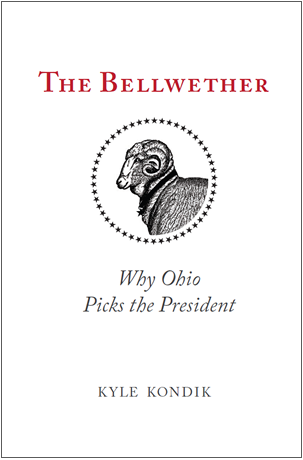 Dear Readers: This essay is partially adapted from Crystal Ball Managing Editor Kyle Kondik’s new book, The Bellwether: Why Ohio Picks the President. (CLEVELAND) – Just a few hundred feet from the U.S. Capitol Dome lies a carillon, or bell tower, dedicated to a man who had put in many years of service in the halls of Congress but who never achieved his dream of taking up residence in the estate several blocks up Pennsylvania Avenue. Here Sen. Robert A. Taft of Ohio, “Mr. Republican,” is honored. Ohio, which produced eight different presidents from 1840 to 1920, has not produced another president since, nor even a nominee. The Ohioan who came closest, running unsuccessfully for the GOP nod in 1940, 1948, and 1952, was Taft, whose father was a president (William Howard Taft), son was a senator (Robert Taft, Jr.), and grandson was an Ohio governor (Bob Taft, the modern-day Taft). In a cycle where the wife of a former president is about to be nominated, and the brother and son of presidents unsuccessfully ran for a nomination, we should remember that political dynasties are nothing new. Nor are the rifts in the Republican Party, where a struggle between the so-called establishment and the grassroots far predates Donald Trump. It also goes back further than the triumphs of Ronald Reagan in 1980 and Barry Goldwater in 1964. That’s where Taft comes in. Taft began a more than three-decade-long career in public service in the Ohio state legislature in the 1920s. His reputation for integrity, which earned him inclusion in John F. Kennedy’s book Profiles in Courage, manifested itself in 1925, when he unsuccessfully fought against a bill backed by the Ku Klux Klan, which at that time boasted of 400,000 members in Ohio, that would have mandated Bible reading in schools. Taft argued that the bill was unconstitutional and that it would be “a calamity if it were to pass.” It passed, but the governor vetoed the bill. Taft ascended to the U.S. Senate in 1938, a strong Republican midterm year, and he positioned himself as a leading voice against the aggressive use of American force abroad. His position, not uncommon for heartland Republicans, put him in conflict with the internationalist wing of the Republican Party as he sought the presidency in 1940. Taft’s timing couldn’t have been worse as the GOP convention opened in Philadelphia that June. Just two days earlier, the French surrendered to Adolf Hitler and his Nazi German armies, which conquered France and the Low Countries in just six weeks. As awful as the events of the past few months have been, the storm of World War II in Europe is a kind of pre-convention game-changer for which there is no modern precedent. Internationalist Republicans, like the powerful Time magazine publisher Henry Luce, rallied around dark horse Wendell Willkie — an ex-Democrat and utilities executive who in some ways was comparable to Donald Trump, at least in the sense that he was a rare presidential nominee without experience as an elected official or high-level military commander. Luce and Taft often found themselves at loggerheads over foreign policy. In a May 1941 national radio address, Taft accused Luce and his allies of “seem[ing] to contemplate an Anglo-American alliance perpetually ruling the world. Frankly, the American people don’t want to rule the world, and we are not equipped to do it.” Those who hear a little bit of Donald Trump in those comments aren’t crazy to think that. In fact, Trump’s use of the term “America First” hearkens back to pre-World War II isolationists, although the original America First movement had more than a whiff of anti-Semitism and became thoroughly discredited, as the historian Susan Dunn recently noted. While Taft assumed his major rival at the 1940 convention would be Thomas Dewey, the future governor of New York and the epitome of the Northeast Republican, Willkie ended up winning the nomination and losing to Franklin Roosevelt in 1940. Taft skipped the presidential derby to run for reelection in 1944, allowing Ohio Gov. John W. Bricker to try for the job. Dewey won the nomination, and picking Bricker as his running mate almost certainly delivered Ohio to the Republican in 1944 even as FDR was comfortably capturing a fourth term. That was one of only two times Ohio has voted for the presidential loser since 1896. Safely reelected, Taft tried for the White House again in 1948, but the eastern wing of the GOP again defeated Taft, the candidate of the heartland. Dewey got the nomination again, losing in a notable upset to Harry Truman. In 1952, Taft tried for the third and final time to win his party’s presidential nomination. Twice before, Taft had been check-mated by the so-called Eastern Establishment, dominated by men like Luce, who believed in a more aggressive role for the United States abroad. Their candidate this time was a nominal Republican, Gen. Dwight D. Eisenhower, who led Allied forces in Europe. In a secret meeting with Taft before the campaign got underway, Eisenhower suggested to Taft that he would not run for president if Taft agreed to support an aggressive U.S. posture in Europe to protect Western Europe against the Soviet Union. Taft declined. But Taft lost again, and Eisenhower broke the establishment’s losing streak that November. Taft became Senate majority leader before dying in 1953. In 1964, as Barry Goldwater was campaigning for the presidential nomination as the candidate of the party’s outsiders, the conservative activist Phyllis Schlafly released a book, A Choice, Not An Echo. The book was an attack on the Eastern Establishment, who she accused of offering voters merely an echo of Democratic policies, as opposed to an actual conservative alternative. Schlafly, who’s still involved in conservative politics, was an early Trump endorser in the 2016 cycle. She said Trump “is the only hope to defeat the Kingmakers,” echoing her trademark and longstanding criticism of GOP party elites. Fitting Trump neatly into the GOP battles of the past is challenging. On one hand, his seemingly half-hearted commitment to Republican economic orthodoxy, like cutting taxes and reforming entitlements, and his status as a wealthy northeasterner in some ways suggest roots in the so-called Eastern Establishment. So too is the fact that some elite Republicans, as early as in advance of the Iowa caucus, seemed to prefer him to Ted Cruz, who like Goldwater fits more neatly in the outsider tradition of the party. But of course, Trump actually had almost no formal support within the GOP before he became the presumptive nominee, and there’s very little that’s “establishment” about his politics. The point here is not to say that the battles between Taft and the internationalists are the same as Trump’s hostile takeover of the Republican Party more than half a century later. Rather, it’s just to note that while Trump is in many ways a unique kind of candidate, the fault lines he’s exposed in this year’s GOP nominating battle are familiar.